At the start of 2017, visitphilly.com was one of the Top-3 most visited city destination websites in the country, according to data from similarweb.com. It was one of Visit Philadelphia’s most powerful marketing vehicles. However, visitphilly.com was aging. The last major overhaul of the website was in 2010. Since then we had been making incremental updates and enhancements, including a project to retrofit the design to work responsively in 2013/14. Our content managers were working in an outdated and inefficient content management system (CMS) and the Visit Philadelphia Press Room was on a completely different server and equally outdated CMS. 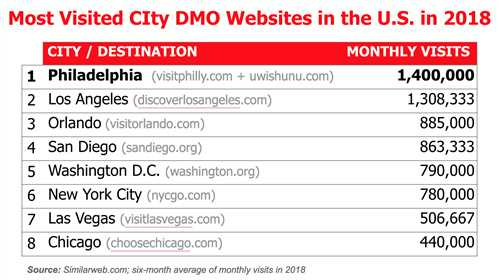 And so our goal with the Visitphilly.com Upgrade was to develop a future-facing, sustainable and highly effective DMO website for 2018 and beyond that delivered a compelling, inspiring and uncomplicated user experience on both the front-end and back-end. - Maintain a high level of reach and influence. Maintain visitphilly.com’s status as one of the Top 3 most-visited city destination websites in the country. - Refined Content Strategy: Build the upgraded visitphilly.com with a sustainable digital content strategy that prioritizes reasons-to-visit- and things-to-do- focused content. - Optimized for Search–Develop the upgraded website to be optimized for organic search. - Optimized for Social–Develop the upgraded website to be optimized for social. - Optimized for Site Speed–Site speed is critical to the success of websites today so we need the upgraded visitiphilly.com to be optimized for site speed. - Stronger Connections between Visitphilly.com and Uwishunu.com–The upgraded visitphilly.com should surface visitphilly.com content and uwishunu.com content on a single landing page. - Enhanced Email Integration–The upgraded website should continue to be our best tool for adding new subscribers to our email list of 200,000+. 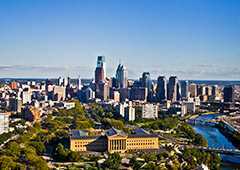 Visitphilly.com invites all travelers to visit the region, but our marketing specifically targets leisure travelers from North America — those who come to Philadelphia to have fun. We have had website visitors from all 50 states and more than 220 countries in the last year. Our website targets a psychographic – people who want to travel – rather than a specific age group or income. Our website is also charged with being as equally helpful to a first-time visitor from far away as it is to a frequent visitor from nearby, so we built the site to be useful to people at various stages of the trip-planning process – inspiration, researching, planning, booking, visiting, etc. We did an extensive content audit before the redesign to assess what content types on visitphilly.com had the most effective return against our mission goals. We used Google Analytics to help assess what content types were the highest performing. We looked at metrics like pageviews, scroll depth, navigation analysis, hotel widget usage rates, bounce rates, and time on page to evaluate what templates were performing the best. We used our findings to help develop a more sustainable digital content strategy for the redesigned visitphilly.com, in which we removed hundreds of underperforming listing pages from the website in favor of focusing more on high-performing article pages. This strategy supports VISIT PHILADELPHIA goals, maximizes internal efficiency and delivers a modern online experience for visitors to the website. - Future-Facing Approach to DMO Website Strategy–The upgraded visitphilly.com delivers Visit Philadelphia with an evolved destination website. - Cinematic & Visually Striking Design–The new design places an emphasis on visuals to build image and drive visitation, and present Philadelphia as a fun, vibrant place to visit, making an impact on website visitors quickly. - Beyond Responsive Design–The upgraded website’s design and UX work seamlessly across devices to ensure the website delivers a compelling and effective user experience no matter the user’s device. - Refined Content Strategy–We built the upgraded visitphilly.com with a sustainable digital content strategy that maximizes internal efficiencies and reflects evolving internet usage, while still delivering against the company’s core objectives. - Simplified Navigation–We built a website with user navigation that adapts to evolving usage trends and is positioned flexibly for future usage evolution. In the 160 days since launch in 2018 (vs the same time period in 2017), visitphilly.com has: - Received more than 5.5M visits, or more than 1M visits a month, maintaining our position as a Top-3 most visited city destination website in the country. (Source: similarweb.com). - Received more than 1.57M visits from social platforms, including 1.5M visits from Facebook. This is a 110% increase over 2017. - Received more than 2.9M visits from Search. Search is still our top driver of traffic to visitphilly.com post-launch. - Received 3.6M visits from mobile devices. This is 66% of all visits post-launch, up from 59% mobile in 2017. - Had more than 31,000 new subscribers sign up on the redesigned visitphilly.com, an increase of 100% over 2017. - Has sent more than 210,000 clicks to Visit Philadelphia’s events-focused blog, uwishunu.com, an increase of 57% over 2017. - Has improved site speed; the average server response time is now .22 seconds–a 54% improvement over the old website.